In 2017, the Department of Anesthesiology Echocardiography Program successfully organized and ran five Echocardiography courses. The courses consisted of a Spring Basic Echo course, a Fall Basic Echo course, a Focused Ultrasound course, and a 3D TEE course at the UNMC Omaha campus. In addition, the program Course Directors conducted a four-day Echocardiography conference in Naples, Florida. Each course varies in topics and includes clinically based material as well as hands-on scanning, simulation, small group case-based discussions, and didactics on echocardiography. The Basic Echo course was designed to teach basic transthoracic echocardiography (TTE) and transesophageal echocardiography (TEE) training. Topics also included Hemodynamic assessment, Valve Anatomy, and Right Heart assessment. This course was created for Critical Care Physicians, Anesthesiologists, Surgeons, Emergency Medicine Physicians, Internists, and Cardiologists. During the Spring and Fall courses in 2017, eleven physicians, comprising of Anesthesiologists, Emergency Medicine physicians, and Trauma/Cardiologists attended the didactics and hands-on training. The 2017 Focused Ultrasound course took place on March 31st and April 1st, with five physicians in attendance, including Anesthesiologists, Pulmonary Critical Care physicians, and General Surgery physicians. During the Focused Ultrasound course, attendees were taught Basic Ultrasound Principles and Knobology, Surface Echo Anatomical Correlation, Pericardial Tamponade, and Focused Hemodynamic Assessment. The 3D TEE course was a three-day, small-group training course with three physicians in attendance. This course covered 3D Imaging, 3D Measurements and Data Manipulation, 3D Cropping Methods, as well as 3D Aortic Annulus. The 2017 Echocardiography conference was intended for the clinician who utilizes echocardiography in their practice in the perioperative and critical care arena for cardiac and interventional procedures. The course focused on common clinical dilemmas where echocardiography can play a role in diagnosis and treatment. 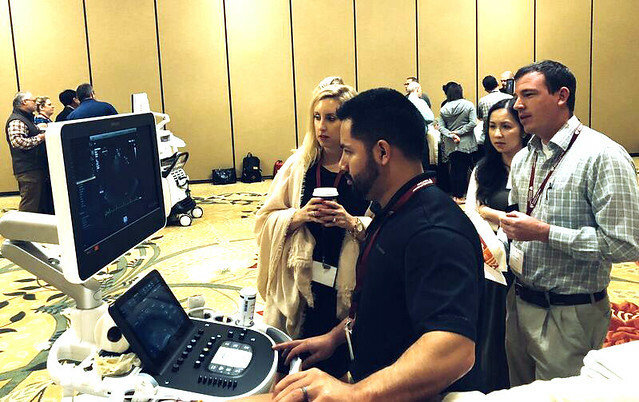 Case-based presentations, practice guidelines, hands-on workshops, and small-group discussions were utilized to review two-dimensional transesophageal and transthoracic echocardiography, spectral and color Doppler, and 3D echocardiography techniques. Over 70 physicians and sonographers from all over the United States and Canada attended the conference.